The plant will be powered by a new generation of nuclear technology called the European Pressurised Reactor (EPR). China looks set to be the first country to operate an EPR reactor with one due to enter service in 2013. 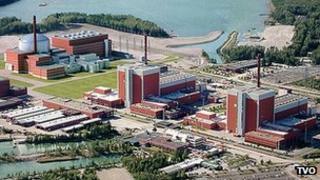 Olkiluoto 3, originally due to be ready by 2009, is being built by French nuclear company Areva and German engineering giant Siemens. In a statement, TVO said it was "not pleased with the situation" although solutions to various problems were being found one by one and work was "progressing". It said it was waiting for a new launch date from Areva and Siemens. Work on the site in south-west Finland began in 2005 but has been hit by repeated delays and has run way over budget. Correspondents say that the French designed EPR is the big hope for a so-called third generation of reactors, said to offer increased safety and better economic competitiveness. However, a similar project in Flamanville in northern France is itself running four years behind schedule. China is building two such reactors at Taishan in the south-east of the country with the first due to enter service at the end of next year and the second a year later.